Websites for babies... it's a new world. This one was done for our own family, but we'd love to do one for you as well. 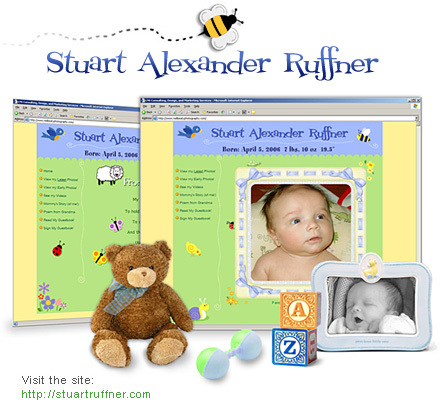 If you want your baby to have a truly unique and personalized website to share pictures, life milestones, movies, and more, then you have come to the right place. Online birth announcements can be updated monthly with new photos and information. And your new baby website can follow your newborn their whole lives. We guide you through the complete process, from obtaining your domain name to designing and hosting a beautiful website — perfect for your new baby. Websites for babies are an advancement on baby books. Since all the information is on the web, it can be accessed anytime and updated easily! Websites for new babies also make great gifts! Imagine being the grandparent or aunt/uncle that gives such an amazing gift. Family and friends can enjoy sharing the baby's precious moments and milestones... photos, videos, and stories. And a childhood website becomes the perfect digital picture/memory book!